If you’ve tasted our lovely breads or just want to know how to get started making your own, then you’ve come to the right place! Making your own bread is easy, creative and fun and our short courses are just the place to start. 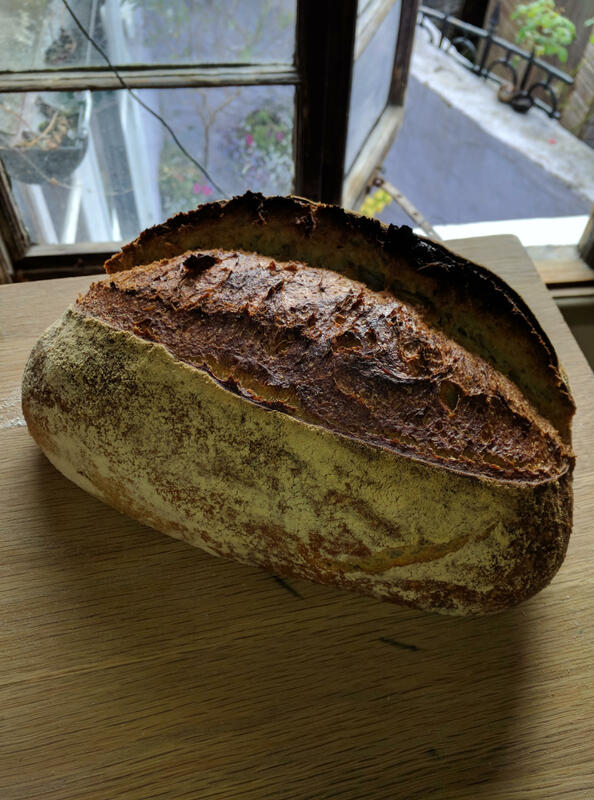 The short 1-day courses run from 10am to somewhere between 3 and 5pm (finish time is dependant on the bread being made, its rising time and how efficient your kneading technique is!) Refreshments and a light lunch is provided, do let us know if you have any food allergies, etc. Course days are usually Wednesdays but other days may be possible. We can manage up to 4 people per course, so get in-touch early to book your place. Note that the bakehouse is up a set of stairs and the house toilet is up another set of stairs. We’ll also be spending a lot of time on our feet, so wear comfortable shoes. It will get hot and a bit steamy in the bakehouse so you may want to consider wearing clothes that would allow you to easily remove a layer if needed. Bring your favourite apron if you like, but we have plenty of our own if needed. An introduction to making bread by hand using just flour, water, yeast and salt. Cost per person is £75. This is a hands-on course and we’ll be making bread using just 4 ingredients; flour, water, salt and yeast. Breads made will include basic loaves shaped in different ways, and a bread for lunch you will be shown and attempt different bread shaping techniques to produce your loaves. It’s useful if you’ve made bread before, but even if you’ve never made bread before you should be fine as you may well be learning new kneading and handling techniques anyway. 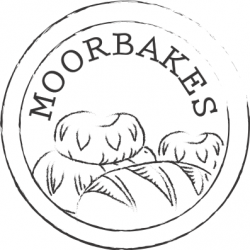 Fancy running your own home-based bakery? It’s not hard, all you need is a little time… Spend 2 days with the Moorbakes baker and you’ll be shown the full workings of the bakery from preparing the levian from the sourdough starters to mixing and kneading the dough in the evening and then and early start the next day to go through the process of scaling, shaping and proving the dough before finally turning it into that days breads and delivering to the shops. Please get in-touch for more details. OK, not just for men… But a fun day making breads, pizza, pastys and something sweet. If the weather is good then we can even do some baking outdoors in our little wood fired oven. New for 2017: Want to learn cook on a barbecue without turning everything into charcoal? (or worse, leaving the middle raw!) then this might be for you. We will make some pita style breads then cook a variety of meat or vegetarian dishes and even bake a cake on our Kamado Joe BBQ oven and grill. It’s all about planning and preparation so we spend some time in the house kitchen before heading down to the garden and getting the fires lit. Obviously this is going to be weather dependant, but lets hope for a good summer! Please check the diary below and do get in-touch for more details.